We are proud to serve the advertising needs of Central Wisconsin. With our extensive inventory of Billboards and Digital Displays and the best team in the business, we will help you craft a campaign and successfully reach your target audience. Central Wisconsin provides a great business climate and an exceptional quality of life for all its residents. Large and small businesses thrive and take advantage of a skilled and dependable work force. Wisconsin is one of the leading dairy producers in the U.S., as well as being one of the largest harvesters of corn, oats, potatoes and cranberries. It is also heavy in manufacturing food, for brands such as Oscar Mayer, Tombstone, Johnsonville and Kraft Foods. In a recent study, Stevens Point was ranked #8 in a list of the top ten places in Wisconsin for job seekers. 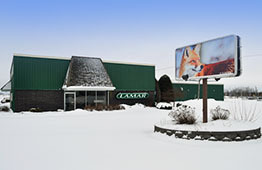 Lamar is the largest Out-of-Home advertising provider in Central Wisconsin. We offer prime coverage in the cities of Eau Claire, River Falls, Menomonie, Rice Lake, Wausau, Merrill, Marshfield, Stevens Point and Wisconsin Rapids. In addition, we cover many smaller cities and Highways and Interstates between these markets. With so many opportunities to showcase your message, Central Wisconsin provides a fantastic backdrop to introduce new products and services, initiate a call-to-action or highlight the success of your brand.